I joined a bee last year and it was okay. The problem was it was on Threadbias and while I kept up and mailed all my blocks, I just didn't really get into the platform. As a result, I didn't communicate much with the other members except to say my block was mailed or if it was going to be late. It just wasn't as fun as I thought it would be because other than Threadbias, there was no other place to communicate really and while I now follow a few new blogs, I still feel like I didn't make friends all that well. Which makes me sad :( But I just can't get into using Threadbias.. it's a great site, but I just don't have the time to devote to using it effectively. So I had an idea. Why not invite some people I already talk with online (and in person in one case!) and think are really super awesome to start a bee with me? We already have avenues of communication set up, so there would be no new platform to get used to checking regularly. 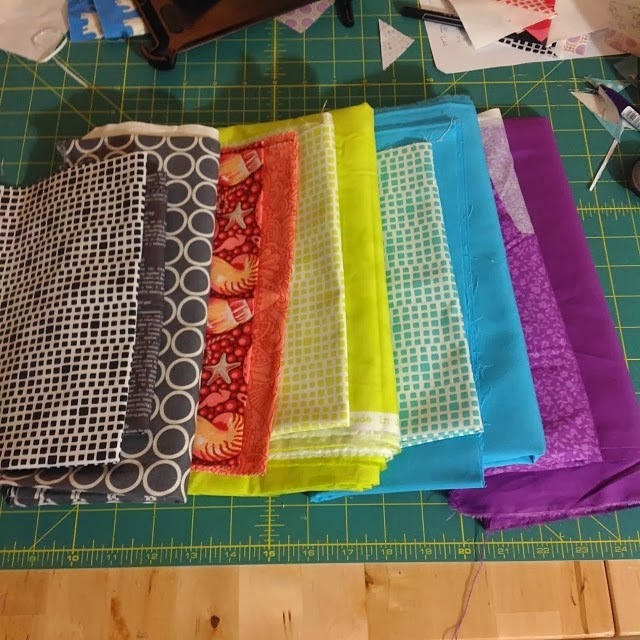 Plus, I already knew these ladies would be my super awesome best quilting friends if we all lived in the same city (so everyone move to Tucson, k?). 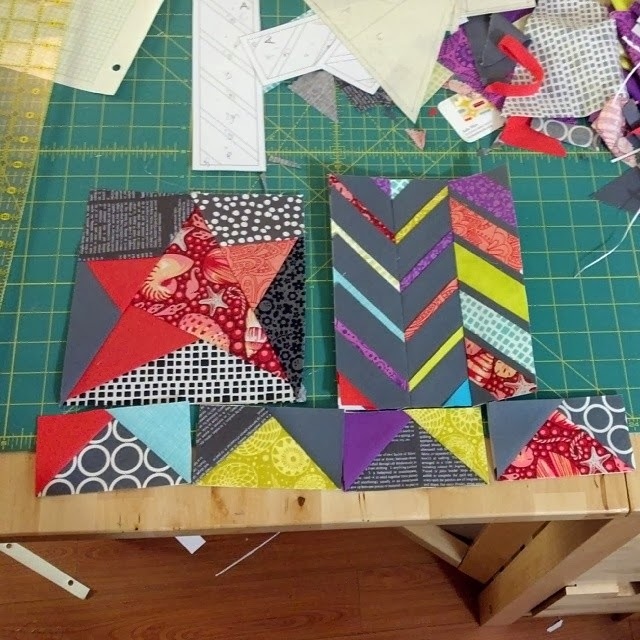 Thus, the Fierce Quilters Bee was born. We decided to set it up as a Traveling Quilt kind of thing (a little like this one here) and keep it small and laid back- fluid mailing dates and few rules. 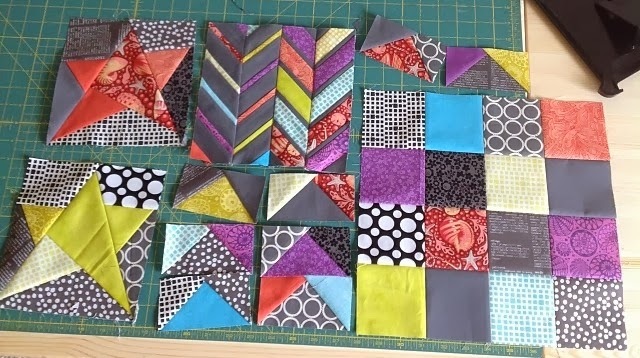 Basically everyone chose their own rules and as a result, we 6 very different quilts being made this year! Here are some (not great) pictures of what I sent off in January to the lovely Audrey. I was in the middle of a move when I was making these, so I didn't have time (or know the box with my camera in it) to take decent pictures before I sent them off. But you get the idea :) Audrey actually has a little preview of what she's been adding up on her blog today if you're interested! You can also watch our progress over on Instagram (#fiercequiltersbee2014). This is going to be an exciting year! I've been finding TB a little slow; just as in I can check the main projects page a few times over a few days and nothing has changed, and in the forum sections it can be days between replies, if there are any updates at all. Compared to the other hives as well, I thought ours was a little quiet! We'd have3 pages worth of posts on a thread whereas the others have twice as much, if not more. I kind of felt sad about that because I think it would have helped if we had a more chatty hive, to get more involved in TB. I know some people there talk to each other via PM and/or in private groups but in general, I think I've seen a decline in different people using the site; it seems like a main few people are posting regularly and others intermittently. I've been enjoying a few bees/swaps/sew alongs which have been good to get into there as other places (like flickr) fill up really fast or I hear about them too late!! I love our bee. It is fabulous awesomeness.